These days no self-respecting hard drive is without at least a handful of multi-gigabyte sampled piano libraries. From meticulously-recreated Yamaha grands, to meticulously-recreated Steinway grands, to meticulously-recreated Bosendorfer grands, all your tasteful piano ballad needs are covered. But what if you don’t want tasteful piano ballads? What if you want something a bit more, well… rock and roll? Something that punches through your mix and lays down the stride? Something with a bass end that thunks along with your kick drum and a treble that can shimmer and glow and break up like a blues guitar? 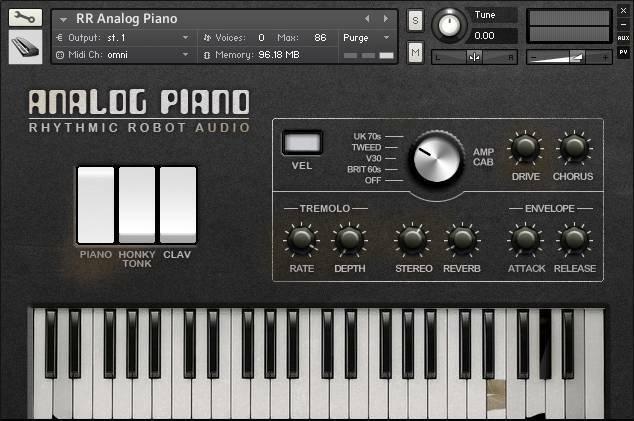 Enter Analog Piano, the antidote to all those oh-so-tasteful silky smooth piano libraries. The source instrument for Analog Piano is the Crumar ColorSound CompacPiano, an awful name for a wonderful machine. The ColorSound was intended as a stage piano, but derived all its onboard sounds from good old analogue electronics. It has three preset tones, of which it’s the piano that makes you stop and take note: rich, solid, satisfying, and with a natural affinity for contemporary music styles. In many ways it straddles the tonal qualities of an acoustic and an electric piano, sounding more like a “real” piano than a Rhodes or Wurli, but with the same EP-style grunt and heat to the sound. The other two preset tones, HonkyTonk and Clav, are less convincing as instrument emulations: the Clav is a rich buzzy tone but without a real Clav’s proper bark to it, and the HonkyTonk is a sort of halfway house, combining the Piano tone’s attack with some Clav buzz – again, not much like a real honky-tonk, but interesting nonetheless. We imagine most players steered well clear of both of these as performance instruments, but for more textural roles they can be unusual and effective, especially put through some effects (as you’ll hear in the demo). In fact, it has to be said that we imagine most real players steered well clear of the ColorSound entirely, for the simple reason that in a moment of face-palm head-slapping madness, Crumar made the thing unresponsive to velocity. That’s right, no matter how softly or hard you hit its keys, the ColorSound just pumps out one unvarying tone. For this reason alone it failed to do well, and quietly vanished into the backwaters of history. That is, of course, what we’ve done. Analog Piano has that funky ColorSound tone at its heart, but it’s a clever little beast and gets louder and brighter the harder you hit the keys – just like the original should have. (Although if you want to be oldskool and play it with fixed velocity, just pop that little white “Velocity” button out again.) It’s also loaded with the goods to get that tone pumping: amp cabs to inject some air and live grunginess into the signal path, plus tube distortion to edge things up. With both of these kicked in, it’s surprising how the Clav and HonkyTonk tones suddenly come alive, lending themselves to basslines and pads in a way that was clearly never intended but which just seems to work. Meanwhile the core piano tone just gets better and better the more you push it, forging happily into the kind of tonal neighbourhood we normally associate with Wurlitzer EPs, all bark and bite. Back off, and it’s pure and rounded in a wonderfully analogue way. If you want to boldly go where no piano has gone before, you can back off the envelope attack, or add some sustained release, to move the sounds away from their origins and into new territory; and you can of course combine the three tones any way you like. The Stereo control adjusts the high-to-low spread of the virtual keyboard; there’s tremolo for injecting some vibe; and a convolution sampled spring reverb to add the vintage icing to the cake. Reach for Analog Piano whenever you want a keyboard patch with a recognisable piano tone but added attitude: whether it’s stabbing through a dancefloor anthem or chunking out a groove in a chillout number, Analog Piano gives you all that grit, warmth, edge and soul you’re not going to get from Yamaha, Steinway and Bosendorfer. Exactly as described on the tin. Love the sound, and it’s very useful when you need a less-than-pristine piano. 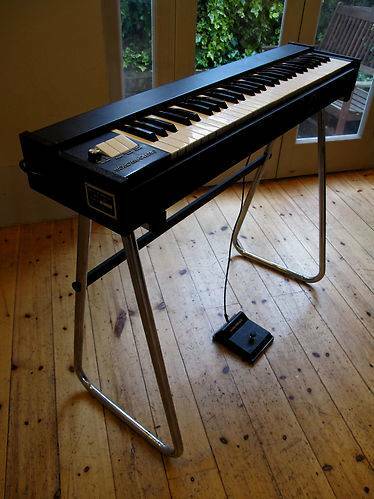 This electric piano has character – quite a different sound to the usual sampler models. The three modes of sound – piano, honky tonk & clav – are all fairly unique and can be mixed which adds layers of opportunities for sounds. Combined with tremolo, envelope and reverb, a startlingly diverse array of sounds are possible. Its grungier than the usual Rhodes/Wurli emulations, but strangely addictive. The Cabinet options add to the options quickly and effortlessly. Overall, a very useful electric piano emulation, with heaps of soul and identity, and great value for the price.